I'm at the point where I want to change the 3D VR controllers into hands/gloves/gauntlets. Would some enterprising 3D modeler/rigger/animator be able to model some simple low-poly gloves for my mod? I'm picturing some brown, low-poly gloves/gauntlets that are rigged to pose them well enough. They'll need to be at rest, point, grip, and grip a sword/staff. I can model these gloves but i have no expierence with rigging and i dont know how to animate object states. Gotta find some tutorials on youtube. Thanks! Modeling and texturing is a great first step. Rigging is quite tricky. I can animate with a good rig, and I can learn how to apply animations/poses in Unity. OK, i've started to work on it. Here's what i have for now. UV's and texturing are next steps. Maybe i also try to make some basic rig later. Edit: BTW, if someone sees any mistakes in model topology or issues with overall shape, please tell me about it. Looking good! 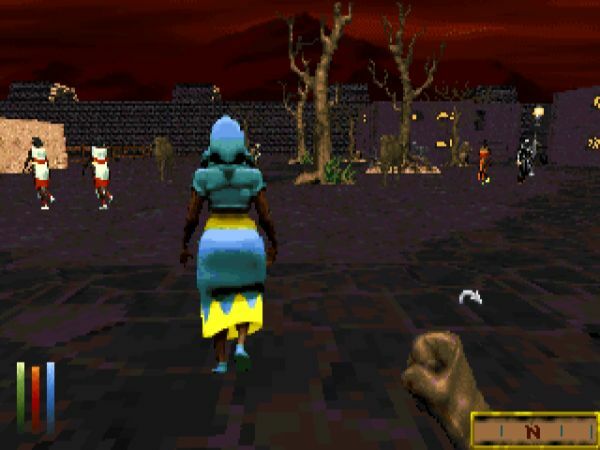 I'm no modeller (it took me 30 minutes to make a 3D Daggerfall mouse cursor), but is the hand a bit wide? The leftmost image, the top of the thumb specially, it comes out to meet the thumb but I'd think it'd go in more, no? And maybe the wrist could be a bit thin and not cylindrical enough? The topography looks good I think. There are some non-looped areas where the edges terminate into a vertex, but maybe that's normal. If it had a simple glove texture I think it'd fit well. Probably minimal smoothing. I was even picturing that a very polygonal hand could fit the aesthetic of the game too, like with this base but half the number of quads. Or maybe that'd look too boxy. I'll need to model or obtain 3D weapons too, if you're interested. I'll make an attribution section for the mod too, of course. Thanks! I was even picturing that a very polygonal hand could fit the aesthetic of the game too, like with this base but half the number of quads. Or maybe that'd look too boxy. You mean even more low-poly, like in late 90's games? I made one more version, but i'm not sure if it will deform good in animation. I dig the style of that one a lot! It's more like what I had in mind--but what I have in mind isn't necessarily what'll look best, especially animated. However, I'd be more inclined to try the second one first. What do you think? Alright then, i will finish low-poly version first and we will see how it turns out. 1. UV'ing was a real pain in the brain (or maybe it's because i'm just an amateur). I tried to use different textures of leather but they all look bad to me on low-poly model. I ended up using default material with brown color fill. 2. There's also .fbx file with fully rigged model in the archive. It's not perfect rig, but i hope you could animate with it. 3. It a model only for the left hand. I don't know how importing to Unity works for such things. Do you need separate model for each hand or combined into one? If you need right hand as separate model, tell me and i just mirror the left one. Thanks, it's looking awesome! I'm able to import it into Unity, and I can animate it in Blender with the rig you made just fine, it seems. I'm having trouble getting the FBX importer in Unity to recognize the animations for some reason, so I've not been able to set them up as control yet. But I'll keep working.